Why company wide head shots are useful when you’re a small business. Last week we had the joy of returning for a third year, to cover the Clean Rivers Clean Lake Conference for our friends at Sweetwater based in Milwaukee WI at the school of fresh water siences. 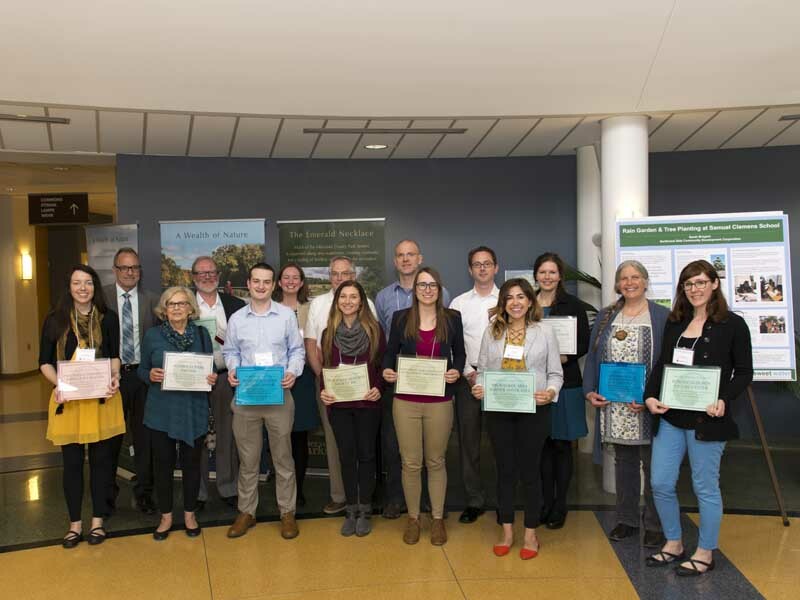 This year’s Clean Rivers Clean Lake Conference was held at Alverno College. Alverno College has such a beautiful campus and was a great location for this event, the staff was amazing and very helpful. If you ever have the chance tour this beautiful campus I highly recommend it. This year’s discussions and panels focused on creating purposeful drainage areas inside the urban landscape, porous pavement, new policies and regulations and how we as good stewards can do out part in these endeavors. As much as it is a day of work for us it is also a learning day. I come from a family with farmers and every year I am impressed to see what these fine people come up with. Some of it in the past I have taken back with me to my uncle’s farm to see if there is something we can put into practice as it pertains to curtailing field runoff into the streams and waterways. Here are some of the photos from this year’s Clean Rivers Clean Lake Conference. How using a business consultant can help your small business. A personal perspective about Vagabond Photography's meeting with Cultivativated Advisors. Vagabond Photography(VB): It’s great day, we at Vagabond Photography now offer UAV(Drone) services to our clients and we can fly anywhere we please. Today we’re going to fly the port of Milwaukee. FAA Rep: Not so fast Mister. FAA: because where your client would like you to fly for their assignment in located inside a restricted flight area. You’ll have to apply for a waiver. The above is true for a Part 107 pilots, as certified pilots we cannot just fly anywhere we or a client would want us too. In much of the Greater Milwaukee area we have to work around controlled airspace via General Mitchel Airport(class C), Timmerman Airport(class D) and Waukesha Co Airport(Class D with a Class E extension) (see map 1). To fly in those areas, we would need to obtain a FAA waiver under part 107.41 requesting airspace authorization. Say a client was to approach us and says we would like you to photograph our new building project on Jones Island and can you do this in the next 20 days? First, let’s refer to the map the little red dot in the shaded purple circle represents where said client would like us to fly. This helps us answer our clients question a little, the right off the bat answer is no not currently. To fly in that shaded area we must apply for a waiver from the FAA. Then provided the FAA gives us permission the answer is yes but it sill could exceed the 20 days the client had requested and take as long as 90 days for a yes, no answer. Also the waiver is time sensitive which mean the pilot in control has to fly at the time requested on the waiver or on the backup date during the approved time. You may ask what does a waiver do for us and why does the FFA require us to obtain one? For the proposed Jones Island assignment there are a few answers. 1. Provided we are granted a waiver, it allows the FAA and air traffic control to notify incoming and outgoing air traffic there is an unmanned aircraft working the vicinity of the airport to the Northwest. If you refer to map 1 again, you will notice that the proposed location is adjacent to the inbound flight line for runway 19R(marked in gray). 2. In the waiver we must explain to the FAA how we plan to ensure safety going above and beyond what part 107 requires. This can be done by adding additional spotters to notify the done pilot of incoming aircraft or by making the drone more visible to oncoming traffic and explain that we do not place to fly outside of a certain radius keeping us away from inbound traffic. Also, that we are not a distraction to other pilots. 3. It saves the pilot and customer from a fine from the FAA if caught flying without a waiver. Through some research the fines that have been given out range between $400 to $18.700 with one outlier being levied at $1.9 million (story here) and also for the pilot it can also mean revocation of his/hers certificate. We've obtained a waiver now what? Great the FAA decided to grant us a waiver and now we can fly, though there are going to be some stipulations on the when and possibly from how long. Also make sure you have planned for a secondary date encase of inclement weather. I understand the a potential client this may seem like a lot of work just to go though to fly around and photograph/video a building or a job site. Though, it is something unmanned pilots and I know is necessary, for safe flight operations for those on the grounds and flying in the sky and at the end of the day you’ll be happy you have an unmanned pilot that took the time to do it right. Every year at Vagabond Photography we get asked to cover a few corporate Christmas/holiday parties which start in December and can run through mid-January. Its always a good time for the employees and for us as well. It’s a night that everyone knows they are appreciated and the stresses of work get left at the door and on occasion there is a chance to win some prizes put up by work. If your company has a yearly Christmas/holiday party consider using Vagabond Photography for your party photography services. This way it allows your employees in marketing or human resources a night off as well. We know they spend a lot of time organizing these events and are normally handling some project/s at the event and it gives them one last thing to worry about. It also is good for in house and out of house marketing tool when recruiting new employees to show that your company is more than just a business to work for, but you represent a family that values their employees.